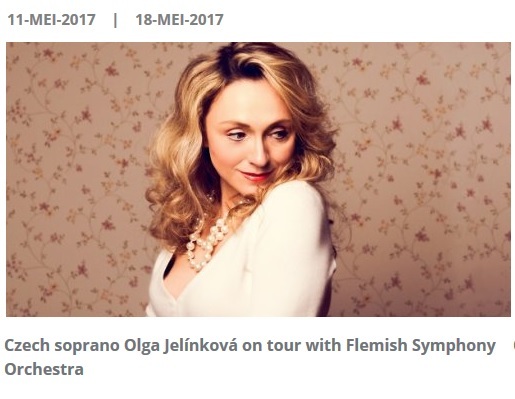 Leading Czech soprano Olga Jelínková will perform on a special tour in Belgium. She will be accompanied by Flanders Symphony Orchestra conducted by Jan Latham-Koenig. The tour is called Abendrot referring to one of the ‘Four last Songs’ from Richard Strauss ‘Im Abendrot’, which literally means ‘within the red sky’. Olga Jelínková will also perform soprano solo from Mahler’s Symphony No.4 and together with Galina Averina will sing the composition of Credeva, which was created by Belgian composer Luc Brewaeys for two sopranos and orchestra. The orchestra will perform on 11th May in Brugge, 14th May in Antwerp and 18th May in Brussels. Coloratura soprano Olga Jelínková has a unique voice using outstanding technique and extent. She has won many singing competitions – she was awarded the first place at the Antonin Dvorak’s International Singing Competition in Karlovy Vary in November 2011. She regularly performs on every Czech opera scene in leading lyric roles such as The Queen of the Night, Constance or Madam Herz from Mozart, Gilda and Nanetta from Verdi, Lucia di Lammermoor from Donizetti etc. Olga Jelínková also cooperates with Prague National Theatre (from 2014) and embodied the Xenia in Dimitrij by Antonín Dvořák in Boston. Jan Latham-Koenig is the music director of the New Opera in Moscow, art director of Orquesta Filarmonica dela UNAM in Mexico City and Flanders Symphony Orchestra in Bruges. Jan Latham-Koenig is said to be one of the best British conductors. In his work he covers a broad and diverse specter of genres from opera to symphony.